With ‘The Second Machine Age‘, Erik Brynjolfsson and Andrew McAfee have written a fascinating book, which deservedly parks in many’s books of the year lists. Written by two MIT scientists, it tracks the impact so far of the digital age and looks at the future. The authors claim the impact of digital technology will be as big, or bigger than that of the first machine age, and will reinvent our lives and economy. Moore’s Law. First formulated in 1962, it roughly stated that the amount of computer power you can buy for one dollar would double each year. This ‘law’ has proven remarkably correct for over 40 decades. It has even proven to be correct for many digital technologies. That continuous doubling has brought us in the ‘second half of the chessboard’ where the absolute amounts increase phenomenally. Digitization of information. More information is available in digital format. With the ‘internet of things’ massive amounts of digital data are created. Network effects. The more people are online and using an particular platform, the stronger the benefits. Organisational capital. Companies investing in IT, typically spend about 10 times that amount on changes in the organisation of the company. Using IT to do existing things faster does not increase productivity much. It’s using IT to do things fundamentally different what makes the difference (a comment often formulated about using computers in classrooms as well). Such fundamental rethinking of production processes usually takes several decades, as existing managers retire and are replaced by ‘digital natives’. They are not exhaustive, you can not ‘use up’ a digital good. Job (and wage) polarisation. Demand for routine manual and cognitive jobs has been falling, depressing wages. Demand has been rising for skills that complement digital technologies (pattern recognition, assessing complex situations…). “Winner takes all” markets. We have been moving from markets with absolute advantages to markets where a small relative advantage leads to absolute dominance. Being a slightly better writer 50 years ago would give you slightly higher scales, as the extent you could market and sell your writings would be limited. There was a market for many writers, some slightly better or worse than others. Today, a writer as JK Rowling can sell her books worldwide, dominating the market for fiction writing. GDP as a measure of economic activity becomes less useful. GDP is based on physical reproduction of items. When digital items are copied, people enjoy from ‘free’ digital services or produce intangibles such as intellectual property and human capital, these are not captured in GDP. Traditionally, productivity growth has been linked to rising living standards. The share of labour in GDP growth has fallen in recent years (to the expense of the share of capital). This, together with the job polarisation, implies that rises in productivity do not longer automatically translate into broadly shared rises in welfare. This explains the jobless recoveries after recent crises. Job polarisation and “winner takes all” markets reduce demand for certain jobs. Inelastic demand. 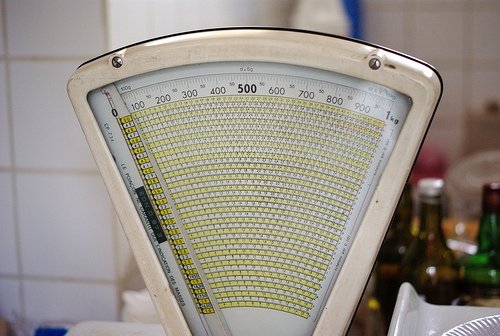 Demand for goods may rise slower than prices fall as a result of technological progress. Technological progress may be faster than the ‘adjustment time’ to re-skill workers for jobs that are in demand. For the solutions, the authors look mainly at education. This chapter is one of the weakest. The authors advocate a re-think of the curriculum towards ’21st century skills’ and a stronger focus on entrepreneurship. The authors put high hopes in MOOCs (only xMOOCs in fact, not the much more interesting cMOOCs), brushing aside the fact that they offer a sub-standard experience of what on-line learning can be. They have a point that, as on-line learning becomes more mainstream, the characteristics of digital goods markets will impact education, such as job polarisation and ‘winner takes all’ markets. In South Korea, for example, lectures from ‘superstar’ teachers with astronomical salaries are broadcast on-line, reducing the role of traditional teachers. But nevertheless a great book on the analysis of how digital technologies have been affecting our lives, and are likely to disrupt it even a lot more. For the part on how education could (and needs to) respond to our changing society, I would recommend other articles, books and blog posts. EdX is a non-profit MOOC platform provider, started up by Harvard University and MIT. Its platform is used by a variety of universities and a few international organisations such as the World Bank and the IMF for delivering free on-line courses, inappropriately called MOOCs. This course took place over 8 weeks and contained 6 modules. The main sectors of a country’s economy were discussed. The pedagogy was based on the usual behaviourist EdX model: lectures of approx. 10 minutes, followed by short practice questions and occasionally interspersed with a little reading or MS Excel exercise. Content was challenging (for me, as a non-economist), with a clear progression from basic principles over simple applications to more advanced scenarios and case-studies. Ideas encountered earlier in the course were regularly revisited. The bulk of the course consisted of explaining the main macro-economic balances (real sector, financial sector, external sector…). The most interesting parts of the course were when these balances were related to real world examples (using thinly disguised pseudonyms such as ‘fiscalia’). Part 2 of the course will hopefully continue with this more applied approach. In order to remain eligible for a certificate of completion a weekly minimum score of 50% was required. Apart from multiple choice questions, the weekly assignment also contained an exercise, made extremely simple because of video tutorials explaining in detail how to do the exercise. I assume this aimed at allowing as many learners as possible to proceed to the next level. Every week, learners were asked to analyse sector data for their country and publish this in the forum. This should have been the most interesting part of the course. Looking at how the monetary or government balances of various countries illustrated the effect of global evolutions or national policies. Unfortunately, very few learners engaged in this activity (me neither, I admit). I believe the main reason is time. The envisioned time per week was approx. 10 hours, leaving many people with little time left to do this exercise and explore others’ postings. Spreading the course over more weeks, or even allowing a separate week for this kind of exercises would be a solution. Also, in a more open and connectivist spirit, encouraging learners to post their writings on their websites or blogs would have allowed outsiders to read and comment. This may also have allowed bringing in some counterweights to the procedures and analyses of the IMF. The forum was clearly the problem child of the course. Most interaction was limited to learners asking questions (duly answered by IMF staff). There was little discussion; in particular during the second half of the course. Given the international origin of participants (given introductions in week 1) this was a missed chance. Activities actively fostering discussion could help, as well as IMF staff taking a more tutoring rather than teaching approach. It’s rather baffling how these courses still largely ignore what decades of experience and research on on-line learning have found. Salmon’s e-tivity model could be used to design on-line activity sequences, insights on communities of practice could be used to foster on-line collaboration and link course content to participants’ contexts. Web 2.0 tools could be used to let participants engage with course content and re-create materials, such as concept maps, blog posts, podcasts etc. This neglect of existing expertise raises questions about the real intentions of the course. These xMOOCs are quite far away from the original cMOOCs as they were introduced by Stephen Downes, Dave Cormier, George Siemens and others in 2008. In fact, based on content and pedagogy, this MOOC could aptly be described as a ‘textbook with ambition’. Moreover, these MOOCs are only open in the sense that they are free, not in the sense that their materials can be re-used or adapted. Such a version of openness can hardly claim to be a social justice endeavour, as these MOOCs often claim to be. A positive final verdict though. Unlike other MOOCs from the EdX/ Coursera/ Futurelearn school, this course offered more than a mere taster. It was a thorough and intensive introduction to the analysis of macro-economic accounts. However, I felt disappointed that the pedagogy still hasn’t improved since the last time I completed a xMOOC. The IMF plans a few other courses on EdX. I’ll certainly give them a try. Some welcome antidote to the avalanche of – mainly US-centred – information assuming that MOOCs started with the 2011 AI (Artificial Intelligence) course at Stanford and the subsequent Silicon Valley fuelled start-up frenzy spearheaded by Coursera, edX and Udacity. The graph below comes from a JISC CETIS publication and helpfully links the xMOOCs to the OER movement and the cMOOC’ers. The figure below, from an excellent paper in Open Praxis from Sandra Peter and Markus Deimann, links MOOCs to much earlier developments such as the Public Lectures and the 17th century coffee houses. Taking a historical perspective arguably has the advantage of countering the techno-utopian language that surrounds xMOOCs. It also subtly dinstinguishes between MOOCs and the AI-offspring, rightly implying that these courses are no MOOCs (at least not as MOOCs were originally intended (YouTube video). A historical form can bring a sense of perspective and yield a cautionary tale or two for the future of online education. Peter and Deimann write: ‘ Historical forms of openness caution us against assuming that particular configurations will prevail, or that social aspects should be assumed as desired by default‘. What kind of information and research is available on MOOCs? What kind of MOOC research would be interesting to do? What are benefits and limitations of the type of information on MOOCs that is around? What is the educational impact (rather than the press impact) of MOOCs? blogs from practitioners and academics, with an overrepresentation of academics from Athabasca Un. and the OU. articles in more popular education magazines such as Inside Higher Education and The Chronicle of HE. The term ‘grey literature’ may sound a bit disparagingly. However, as Martin Weller writes, notions of scholarship and academic publishing are evolving. Blogs and open journals constitute alternative forms of scholarship with more interaction, less formality and shorter ‘turnaround’ times. It’s interesting to see how many of the more general news sources seem to have ‘discovered’ MOOCs only after the Stanford AI course and the subsequent influx of venture capital in start-ups such as Coursera, Udacity and edX. 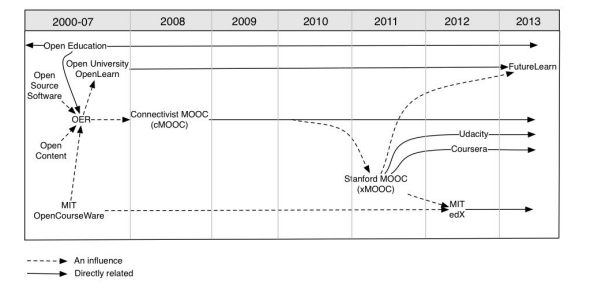 The ‘original’ connectivist MOOCs, that have been around since 2008, let alone open universities are hardly mentioned in those overviews. A welcome exception is the Open Praxis paper from Peter and Deimann that discusses historical manifestations of openness such as the coffee houses in the 17th century. The advantage of this grey literature is that it fosters a tremendously rich discussion on the topic. Blog posts spark other blog posts and follow-up posts. Course reflections are online immediately after the course. Events such as a failing Coursera MOOC or an OU MOOC initiative get covered extensively from all angles. This kind of fertile academic discussion can hardly be imagined with the closed peer-review publication system. The flipside of this coin is that there are a lot of opinions around, a lot of thinly-disguised commercialism and a lot of plain factual mistakes (TED talks!). MOOCs may be heading for a ‘trough of disappointment’ in Gartner’s hype cycle. Rigorous research would still be valuable. For example, most research is descriptive rather than experimental and is based on ridiculously small samples collected in a short time. Interrater reliability may be a problem in much MOOC research . Longitudinal studies that investigate how conversations and interactions evolve over time are absent. Sir John Daniel’s report ‘Making Sense of MOOCs‘ offers a well-rounded and dispassionate overview of MOOCs until September 2012. What constitutes success in a MOOC for various learners? How do learners interact in a MOOC? Are there different stages? Is there community or rather network formation? Do cMOOCs really operate according to connectivist principles? What are experiences from MOOC participants and perspectives of educational stakeholders (acreditation agencies, senior officials, university leaders) in developing countries? Why do people choose not to participate in a MOOC and still prefer expensive courses at brick-and-mortar institutions? What factors inhibit or enhance the learning experience within a MOOC? How to design activities within a MOCO that foster conversation without causing information overload? How do MOOCs affect hosting institutions (e.g. instructor credibility and reputation) and what power relations and decision mechanisms are at play (plenty of scope for an activity theoretical perspective here). High drop-out rates in MOOCs have caught a lot of attention. Opinions are divided whether this is a problem or not. As they are free, the barrier to sign up is much lower. Moreover, people may have various goals and may just be interested in a few parts of the MOOC. MOOCs (at least the cMOOCs) are by its nature decentralized, stimulating participants to create artefacts using their own tools and networks, rather than a central LMS. cMOOCs remain accessible online and lack the clear start and beginning of traditional courses. This complicates data collection and research. Although MOOCs are frequently heralded as a solution for higher education in developing countries, it would be interesting to read accounts from learners from developing countries for whom a MOOC actually was a serious alternative to formal education. The fact that MOOCs are not eligible for credits (at the hosting institution) plays a role, as well as cultural factors, such as a prevalent teacher-centred view on education in Asian countries. Peter, S. and Deimann, M. (2013) ‘On the role of openness in education: A historical reconstruction’, Open Praxis, 5(1), pp. 7–14. 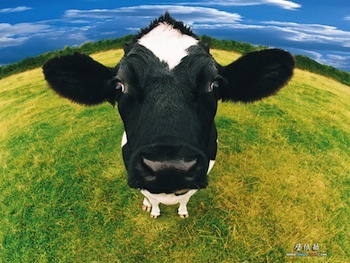 2012, Year of the MOOC? In various places (such as the New York Times) 2012 has been heralded as the year of the Massive Open & Online Course, also called MOOC. Although MOOCs have been around since 2008 or so, developed by researchers like Stephen Downes, David Courmier, George Siemens, Jim Groom and others. They are based on a connectivist pedagogy, characterised by distributed content, network formation, creation of artefacts outside course-related structures and superfluous course boundaries. MOOCs based on these principles are often dubbed cMOOCs, to distinguish them from their less salubrious nephews. 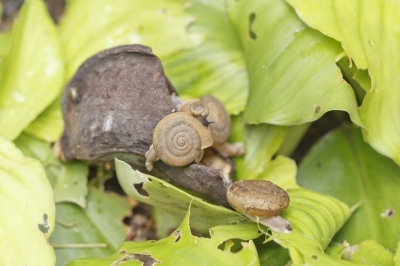 The main in change in 2012 has been the entering of Ivy League institutions in the MOOC fray. As OU vice-chancellor Martin Bean notes, the arrival of great brands, lots of (venture capital) money has vastly increased the forces of disruption. The entrance of Silicon Valley in MOOCs has been spearheaded by Coursera, Udacity (both offshoots from an open Artificial Intelligence course at Stanford University) and edX (grown from MITx after investment and participation from Harvard University and UC Berkeley). Online courses from these providers routinely attract tens of thousands of people (although drop-out rates are stratospheric). Mass media have picked up the phenomenon (New York Times, The Economist, Financial Times). Coursera has been gradually expanding its offer to non-US universities and currently offers more than 200 courses from 62 universities and 14 countries, including France, The Netherlands, Hong Kong and Italy (no, not from Belgium yet, no surprises there). It’s interesting to note that these institutions have largely missed out the evolution to online learning so far and their Silicon-centredness and lack of regard for 40 years of research in distance and online learning has been derided by researchers. In the UK the Open University (OU) has recently announced its own MOOC platform, Futurelearn – here is a worthwhile reflection from OU researcher Doug Clow – and in March a ‘regular’ online course (h817) will be offered partly as a free open course. Dubbing 2012 the ‘year of the MOOC’ may seem condescending to institutions and researchers who have been active on the topic for years. However, there’s no denying in the worldwide appeal of the Ivy League institutions and their disruptive power. Many challenges remain, in terms of business models, learner interaction, accreditation and quality. It will be interesting to watch if also this disruptive innovation, like radio and television before, will evolve from an open, bottom-up structure full of creativity towards a commercialised and closed system, as described so beautifully by Tim Wu in ‘The Master Swith’ (blog post on the book). The Khan Academy and the Introduction to AI course at Stanford University are two examples of innovative use of the internet to increase access to quality education and challenge traditional educational models. 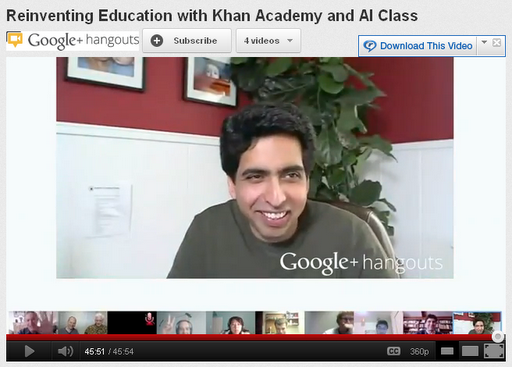 Khan Academy is centered around a library of short videos on (mostly) science and mathematics. The AI course from Peter Norvig and Sebastian Thrun at Stanford University attracted more than 58.000 students and 175 countries. In this interesting 45’ video they discuss their experiences with online learning and how they see the future of education. George Siemens, a lecturer from Athabasca University and pioneer of open courses such as the LAK11 course, provides some thoughts on the video discussion on his blog. They expect a (further) decoupling of the teaching and the accreditation. People will pay for rigorous assessment and subsequent accreditation, but they will have more options on how to prepare themselves. They may enroll into a formal course, learn from work experience or use Open Educational Resources (OER). This reminds me of the TOEFL test, which offers an internationally recognized accreditation for the level of English, but you can learn English in a variety of ways, not limited to the courses offered by the credentialing institute. This tendency will force institutions to rethink their roles and business models, as their oligopoly on education and accreditation will be challenged. Online learning permits more easily ‘flipping’ the classroom. Students watch lectures at home, then work on problem sets in class, where the teacher can assist them one on one. More importantly though, students can work at their own pace. Khan is convinced that most students want to learn, as long as it is adapted to their pace and needs. Both the AI course and the Khan Academy are creating tremendous possibilities for learning analytics. The effect of small changes in content, learning experience or other motivating factors can be analysed or preference different explanations of a concept. I liked how Khan recalled the origins of Khan Academy and muses that the non-professional look-and-feel of the videos might actually be an important reason for their success. The videos feel like it’s their elder brother explaining a concept to them. Khan admits that if he would have received a million dollar grant to develop the videos, they would probably have looked like sleek McGraw-Hill videos with a polished voice-over. In Cambodia VVOB has developed 185 short science videos, in which science teacher trainers explain low-cost science experiments. In the programme we have given priority to quantity and content, rather than to production quality. It would be great if some teacher trainers could continue the work and make their own short videos, explaining concepts or experiments, just as Salman Khan has done for his cousin and is now doing for thousands of students. The LAK11 course is not yet completely over – the last week even looks busy and interesting, with various lectures on the future of learning analytics -, but why not make a short round-up already? A MOOC (or OOC, since MOOC apparently sounds similar to the Catalan word for mucus) is a massive, open and online course. This earlier blog post outlines the characteristics of the genre. a. The participation at the course of experts from a wide range of domains guaranteed interesting forum posts and a range of contacts and resources outside the regular course materials. Learning learning analytics by joining with the learner analysts, in real connectivist tradition. These “expert participants” formulated critical questions and comments, and thus helped avoid the “group thinking” pitfall in online courses. b. The course facilitators were excellent in moderating the discussions. They managed to make the guest lectures and the round-ups interesting for both experts and non-experts. d. The open character of the course gives you the freedom to contribute how and when you want. If you have a lot of time, you can do all the readings and create a summary. If you’re too busy, you can limit yourself to reading a summary from a fellow learner. A daily e-mail with a short round-up and a few links is sent out daily by the course facilitators. e. The online character is perhaps an evident point, but I keep finding it amazing that you can participate from Phnom Penh in a course on learning analytics, organized from Canada with speakers from Canada, the US and Europe. a. How can such a MOOC be economically sustainable. Preparing and facilitating the course takes a lot of time, and nobody is paying a course fee. Offering accreditation on demand (and for payment) could be an option, but I don’t think this was an option for this course. Improved positioning of the organizing university could bring economic benefits maybe? b. Forum activity decreased strongly after a few weeks. I’m not sure (since this was my first MOOC) whether this is a recurring trend or because of the more specialized course content during those weeks. To complete a MOOC however, intrinsic motivation needs to be strong (and remain strong).